The experience itself is unlike anything you and I have ever experienced. Let's start off by saying that my pictures just don't do the experience justice. It is unique and cameras can't catch what our eyes can. I also had taken photos of the food itself, but with the lightning, I was unable to capture shots that were flattering. With that being said, be ready to see some real interesting things. I am going to keep this critique vague on part of the story itself. The experience itself revolves around the world's smallest Chef giving you an experience around the world. Images are projected, using the book as its canvas. The 3-D rendering is spectacular. That in itself is enough to justify the experience. A photo for how immersive it truly is. I want to take a moment and address something that I feel needs to be in the forefront of the conversation. I feel that the experience, meaning the projectors and story-line greatly outweighed the flavors and dishes served. Because this is a unique experience, I do not want to spoil any details of the dishes and what they may be, but it seemed to me that 3 dishes were on par with the experience while the other 3 seemed to be an after-thought. What I find even more interesting is that it is the final three dishes that I find to be what I was expecting. Lucky for all of you, the main course (choose the duck) was spot-on. Well cooked, seasoned, and the vegetables served with it were both flavorful and plentiful. The last three dishes stood out because they were exactly what I expect in an experience such as this. I do not have much to compare it to (as projector with food is a first for me) but based on multi-course immersive experiences, I feel that it fell a little short - until the end. 3 - service. From the servers to the host, all are professionally trained to give you a smoothless evening. Drinks are poured correctly, dishes are placed over the correct shoulder and their is a sense that they choreograph their night very well. Here, you will be paying $162 + an $11 fee to book for 6 courses. It's worth depends on how much the audio/visual aspect of it interests you. If you have the money for a special event, this could be it. If you don't care about the story line and just want amazing food, it really isn't for you. If you aren't picky about food, this experience could be worth it. It truly is a treat for your eyes. Let's get all 6 courses to better represent the evening, and then perhaps the $162 pricepoint will be justified for me. What do I think of Bartaco? It's life-changing. The human body is made mostly of water. Mine is made mostly of tacos. I could have a taco only diet and die a happy a man. You could literally do anything and everything with it. I have talked about this time and time again, but making a taco that resonates takes work, discipline and whole lot of love. Bartaco seems to nail it. Now I know what the haters will say - "the portions are so small! ", "I have to spend so much money to get full". To them I say - "I don't care." First of all, quit eating to get full. You are not running out of food tomorrow, and if you leave food on your plate, it's okay. If we all as a whole just ate a little less, we would be much healthier, and get to enjoy much better things. Needless to say, I am looking to host a Bartaco party. I want like 100 people to come with me so we can order 300 tacos or so. Imagine that picture. Heavenly. Went with my sister. She has introduced me to a couple solid places. Bartacos takes the trophy so far. Started with the Guacamole. You will be surprised how badly people can mess up Guacamole. I am dead serious. You would think a predominately 7 ingredient side dish would be easy to master. I guess not if I keep running into it. But Bartaco you are killing it, guys! A few baked whole tortillas come and you get to crack it how you like. I went with the artistic way and used the back of spoon to smack the middle of it. Very anti-climactic result. Still delicious flavor. No need for extra salt. It was light enough to know the avocado was fresh, and dense enough to appreciate the art. I mean you guys know what I'm talking about right? If you don't leave an avocado out exposed to air and then take a bite of it a few hours later. It takes a little like creamy iron. It oxidizes so fast. That is why it's essential to have fresh guacamole. That's as good as it's going to get, peeled right there and then. That's it. It is that simple. Some bagged tortilla chips come out with El Paso salsa dip and you know you're in a chance encounter. At that point, it's a gamble. It could be some real divey place that just doesn't care about the chips, or it could be just garbage (message me if you want to know an example of that). If you order the Guacamole and it comes out with no flavor, you know to avoid anything with avocado in the name. If they have an option for salsa and chips as an appetizer, order it. If you get salsa, and the salsa is watered down tomatoes (tomatoes are already watery enough! ), get out. They will end up putting that salsa on everything and ruin the entire experience. If you can't somehow make a quality salsa, you obviously don't care. Lastly, the Elote. What is elote? It's Mexicos gift to the world. Steamed corn (often times boiled), then Chargrilled (sometimes still the stalk on it), some sort of butter/mayo base, ancho chile powder (or a variation of spices), cotija cheese and a touch of cilantro if wanted. It's a street food. You can find this in Mexico for $.50. It's cheap and so good. Ain't so cheap here but that $3-$4 price tag is worth it. If you see those grilled marks (sometimes a burnt kernal here and there), and that fresh cotija cheese on top you are walking into a fine establishment. If you are reading this Bartaco, I want you to know that you won in ALL of the categories. I just knew it was going to be good - and when the server saw me using a knife to cut the kernals off the cob, he even offered and brought me a bowl of the elote off the cob (which is called esquites if you'd like to know). Shout out to the man for fulfilling my dreams. Now on to the tacos. What makes a good taco? It's what's in it and around it. Of course. At the heart of it all, lies the tortilla. You can ruin a taco with a horrific tortilla experience. Bartaco knows this and dishes out some quality things. We ordered 5 different tacos. Duck, Mushroom, Carne, Lamb (secret taco) and Kimchi. All great but at the top for me was the Duck. My sister obsessed over the mushroom. Two of them are wrapped in lettuce which is an option for you gluten-free people! 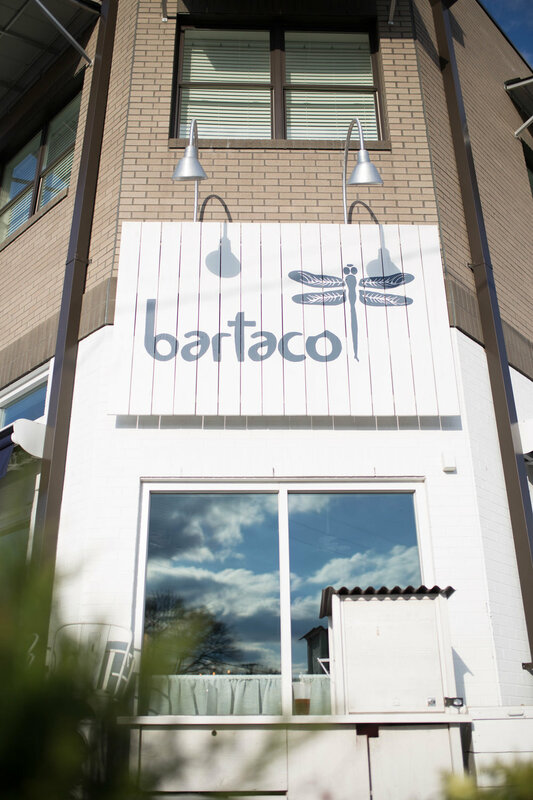 I already feel like this review is longer than most so if you take anything away from this, it is this - Bartaco is hands down the best taco experience. Word to the wise, if you are a big eater, order a few bigger sides and you'll be set. By now you may be wondering - "Why is this dude always in East Nashville?" - I live here. Now let's look at some tacos. We all know that Mexican food is God's gift to this part of the world. We all eat it. We all like something about it. It can range from tacos to enchiladas, and from carne asada to a classic mole. It has it all. If you ever get the chance, get down to Mexico and experience the food (especially the fruits) - it is incredible. Needless to say, I am ALWAYS down for a classic Mexican place. 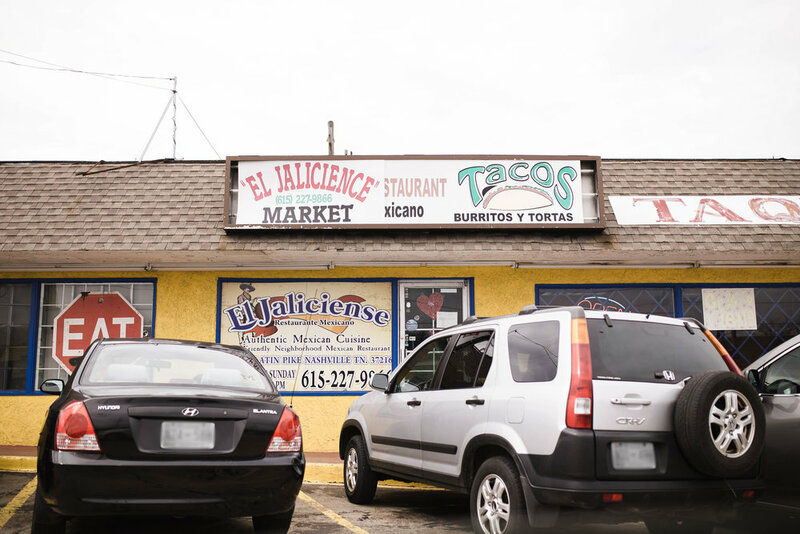 El Jalicience has become my go to. As you come in you are greeted with a kind of bland entrance. Nothing neat about it. It's just really simple. The three times I came in I was left wanting to listen to what the kitchen was jamming out to. They had the right idea. On the dining room floor, it was music-less and the TV was playing some novela - could do better on the feel. But this isn't an interior design blog - it's a food blog. Ignore the chips on the left. They are awful. I just don't understand how hard it is to get good chips. I mean, all you have to do it make a tortilla (easy), cut it into triangles (easier), and fry it (easiest). Boom. Quality chips. Same price. But the main act is the Ceviche Tostada. I mean this thing is big. Like REALLY BIG. Like "wait, I only paid $3.99 for this. Why is this the size of my head?". 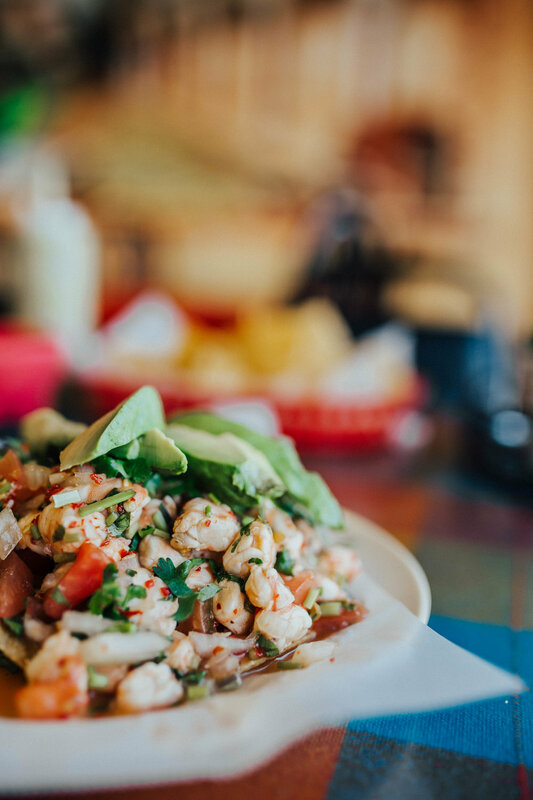 Grant it, it isn't the freshest Ceviche out there. It's obviously that seafood mix that you avoid at the grocery store, yet, it's really good. 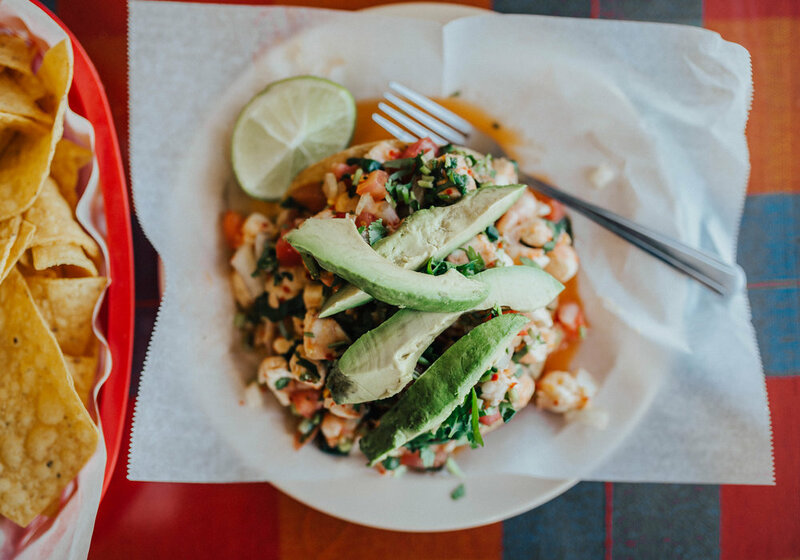 The avocado is fresh (shocking) and the tostada has the perfect amount of spice. I was honestly shocked at how good this tostada was for $3.99. That's the kicker. The price reflects the quality. I would rather get this than a crunchwrap supreme anyday! That is a meal in itself. Piled high. I made the mistake of thinking it was small. Not at all. You have been warned. Of course, no Mexican place is complete without some grilled 'carne'. It's amazing. It's easy as that. I really don't have to write more about it. The cheap cut of meat was cooked perfectly that it had SO much flavor in every bite. The grilled onions, tomatoes, and jalapeños were the blend that you're little make-shift taco needed (side note: the peppers I have had both times I was there had the flavor but not the spice you would expect!). But unfortunately, all good thing's have to come to an end. The tortillas - nuked in the micro. The rice - in a warmer so it comes out dry. The beans - kept warm all day that they get dry and flavorless. To be honest, I just avoided that side of the dish and still felt great about the meal. Perhaps they would let you sub those for some sour cream, guacamole and some lettuce. I wonder if I asked them to grill the tortillas instead of microwave they would do it. That would be a game changer! Let me know if you have any luck with the switch-a-roos. I think the pizza is the ultimate comfort food. Simple as that. Will Slim & Husky be part of my Pizza special? Yes. Yes it will. It's a unique location with a familiar concept: choose a layout, or build your own pizza. It ain't an original idea but it's the idea done right. They have created an environment that truly identifies with it's roots. That's what I LOVE. Show me a restaurant that is delicious but has sacrificed its identity to make it and I will be disappointed. Show me a restaraunt that is not only good but has a story and culture behind it, that's a win. Be willing to wait in a line when you come. They got one. Without a doubt. (They did tell me Wednesdays are slow days so go then if you are in a rush). The wait is worth it. Toppings aren't anything super special, but it's that sauce that does it for me. Particularly the spicy red sauce. I got that the first time. This time I opted for the pesto and it was still good. I just love building my own pizza without someone nickel and diming me for every little thing. So i'll get out of the way what I did not like - the bread. But look, it isn't bad! It isn't the best you've ever had either. It does not matter though because that's not the reason you come here. You come here to be with friends. You come here to feel like you are part of something bigger. It's the vision that started this place that resonates with the world we all dream to be a part of. "he makes dough, but don't call him dough boy" - paraphrased signage. I want to take a moment and introduce what food is really all about. It's a language. It's a means to a bigger goal. Every notable restauranteur I have met has had some greater goal than just feed the masses. Slim & Husky has that story - and it's a good one. 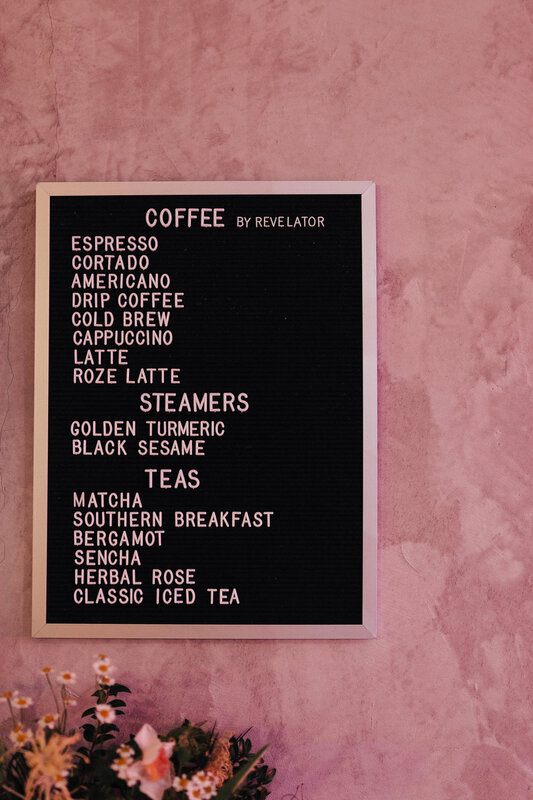 The story of three people, getting together to create an iconic neighborhood establishment that not only makes delicious food, but employs those from the community - with the greater goal to build up the youth. They are invested in the future. They are in the business of changing peoples lives, and making some dang good pizza while doing so. I got the California Love, with half chicken and half salmon, husky size. Essentially you got two sizes, Slim & Husky. I have seen ZERO people order Slim both times I went (who doesn't want pizza for breakfast??). Most people get theirs stacked and add cheese on top to melt all over it. In order to take a picture of something pretty, I decided against it. Delicious. Toppings are roasted perfectly through the oven. It's just a solid pizza. It isn't anything super unique but it gets the job done. You are buying into this communal table cultural experience. Eat at a place where you can talk to those next to you. A place where meeting new people is encouraged. When people get together to make the world a better place, others typically join in. It only takes one to create a difference. Who knew that pizza could bring a community together? Well done Slim & Husky. Much love. It's East Nashville Restaurant Week. Let's see how many I can make it too. 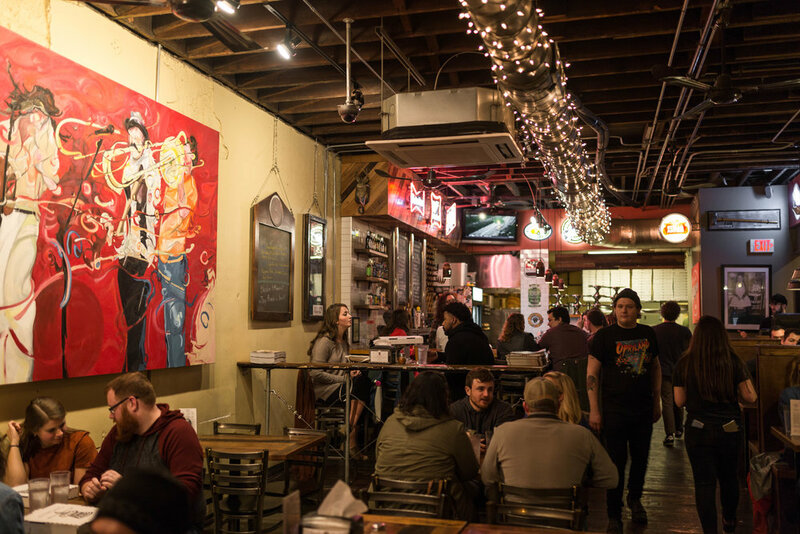 We got quite a few of these East Nashville Restaurants participating in Restaurant Week. I'll throw that link in at the end of this post. To give you some background, I got here at 5pm hoping to be the first there to snag a seat by the limited window space. I got a seat, but did not realize that dinner started at 6pm. So those very beautiful natural light photos are going to have to wait. What do I think of it? No idea. I honestly wish I had more input. I just did not have enough to really figure out if I liked the place or not. Fun Fact: I don't drink - so I can't have an opinion on those (but if you dig mocktails then let's talk). The special going on is a simple one. $15 gets you a drink and an appetizer. They had three options - Shrimp Aquachile, Squash, Pork Belly. I opted for the Pork Belly. It was good. The presentation was beautiful. The actual flavor profile of it all was spot on. I am a mustard fan but I know many that just don't appreciate it. This mustard is tasty and subtle. It didn't carry that vinegar aftertaste. The greens on top were nicely sauteed. The pork was crunchy on the outside and delicate on the inside. It had random bursts of flavors that triggered some nostalgia. Not the best pork belly I have had in terms of cook quality but the garnishes on top brought out the deeper flavors. Contrast + Texture = Success. Now here is my personal opinion on it all. If you aren't getting an appetizer, expect to spend $20+ on dinner - and that's the low end. Unfortunately, this place did not feel like I should be spending $20-$35 at. It honestly felt more like a tapas bar that specialized in cocktails. The scene was trendy (hipster), the ambiance was minimal, and that to me kind of put me off. This is rare. I really don't have this opinion on a location not meeting up to the food standards. It's usually the other way around. I guess what I am saying is that I actually had no problem with the food - it was more of the overall feel of it. Last note: service was great. Server was Alex. Met the owner. All wonderful people who were able to accommodate me last minute. Perhaps if I sat on one of the regular tables my experience would have been complete. I mean, I did choose to sit on the tiny stools with the tiny table (pretty marble though). I'll go back. Hopefully, during the day, and I'll snag a big boy chair. I went on the best possible night. Let's jump right into it. You definitely won't be seeing this on the side of the road. No way you pass it really. The road that could lead up to it is closed. So consider this a blessing in disguise. 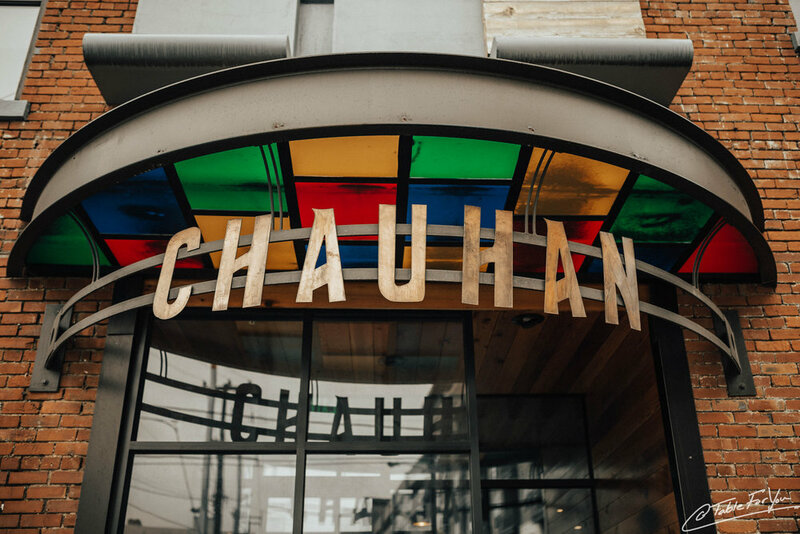 Tucked behind World Gym, you will find a collection of three restaurants all belonging to the same restaurant group (Morph Hospitality): Chauhan, Mockingbird and Tansuo. Now when I think of Asian I think of going on dates with my wife. For some reason, when we are trying to figure out a place to eat I always end up suggesting Asian. I guess that is what I'm constantly craving. Now get this, I have not been to another Asian place here in Nashville yet (so if you got suggestions, comment below!) so my post is strictly based on what I compare it to other places I have been around the country. First things first, this place is amazing. The history of Dim Sum is an old one. It originated from the Cantonese region. If you want to learn a bit about this unique cuisine (which I find fascinating) check out DCU (Dan's Culinary University) this coming Sunday. 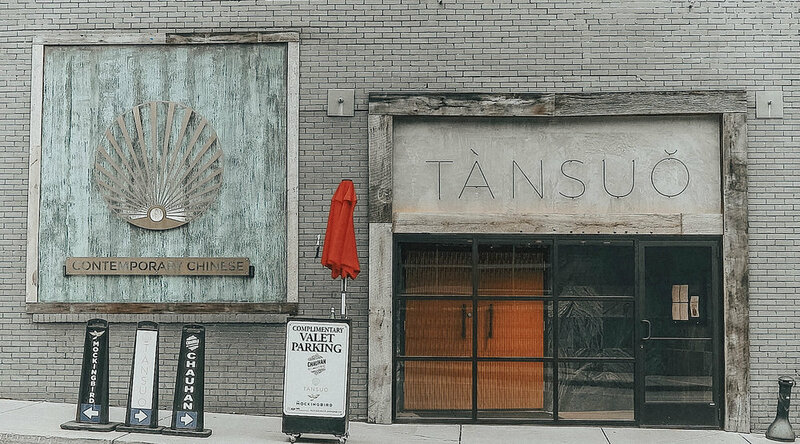 It has to be the family aspect of Dim Sum that makes it so appealing to me, and that's exactly why I love Tansuo. It incorporates all aspects of a culinary experience. From the decoration to the black and white movie playing in the banquet room. All are part of the experience. Now I am going to omit all the details from the event that night. You see, I was able to go on Chinese New Years, and... they went all out. Lion Dancers, Silk Gymnasts, Live DJ and even a dancing panda adorned the evening. Service was amazing. All went well. But let's talk about the big detail. The Food. I want to start with these masterpieces. They call it Golden Eggs and I love them. Stuffed with Tofu and Shitake mushrooms, these things are an explosive of flavor. The sesame covered rice dough is literal perfection. General Tso would be proud. Well I guess not really him. You see this dish was crafted in the mid 20th century while General Tso himself (Zuo Zotang) was alive during the early 19th century. Either way, whoever came up with the dish (it's still debated today), would know that it has reached its peak. Tender. Juicy. Crispy. And most importantly of all, dark meat. It's the most delicious part of the chicken (sorry breast eaters). I would highly recommend that you order this dish. Make it priority #1. Thank me later. Now this dish I was not a huge fan of. I mean, it was there, but it lacked that Asian flair that we have grown accustomed to. The short rib was delicious but the flavors sort of took me out of the moment I was having with the General Tso's. The sauteed vegetables carried a lot of water that sort of diluted the flavor of the rest of the dish. Would advise against ordering this one. 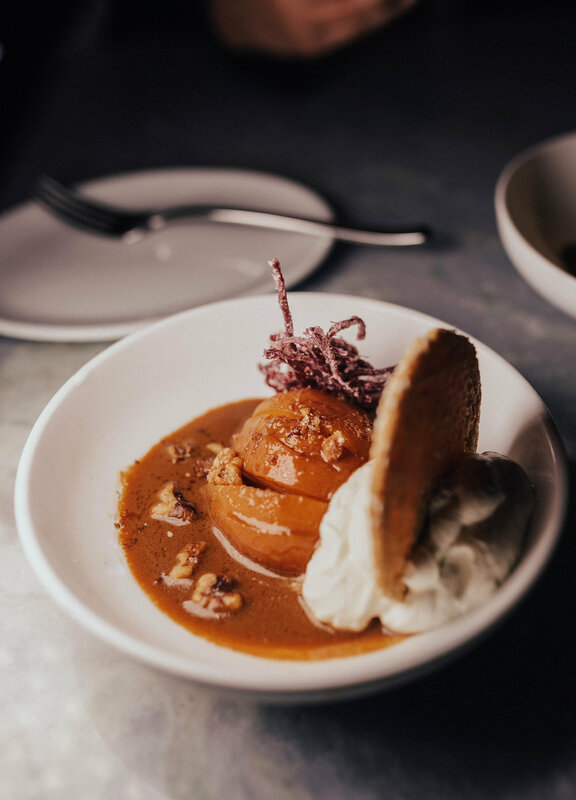 Poached Pear w/ Caramelized Ginger. We had few options for dessert. I am a self proclaimed Ice Cream lover (if you know the best spots let me know below! ), so I naturally ordered the spring rolled wrapped ice cream. The server at the time advised me to get the pear dish instead. I thought about it but stuck to my original choice. When the dessert came out, I was surprised to see the Pear come our along side of the Ice Cream. I asked if it was a mistake and the server said that it would be on the house. I took a bite of the Spring Roll Ice Cream, good - but nothing amazing. I then took a bit of the pear, topped it with some cream and walnut, and I fell in love. The soft texture of the pear went so well with the crunch of the walnut. I then took a small bit of the caramelized ginger (you know how I feel about ginger), took a bite and knew this dish was the one I should have chosen. When asked for Dessert. Pick. The. Pear! I truly enjoyed the feel and concept of this restaurant. It brings you in. It takes you away from the world where you came in from. Come in a busy night and you no longer feel like you are in Nashville. 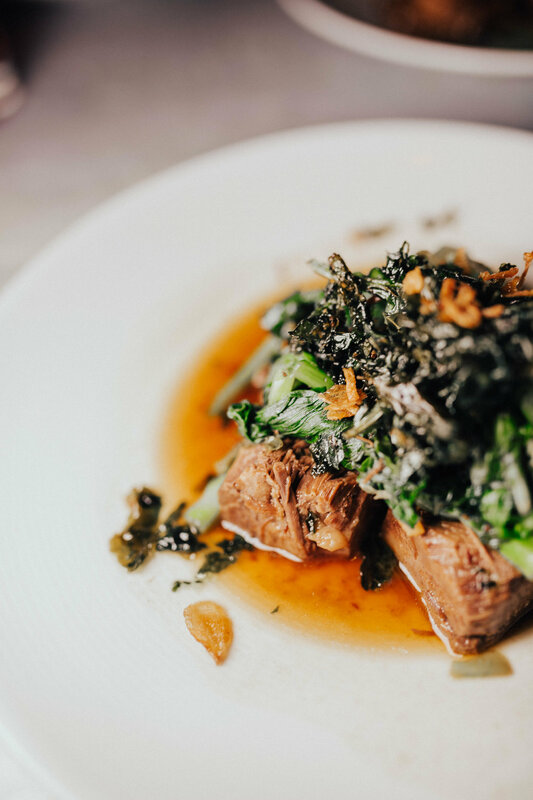 It feels as if someone led you down some stairs in a New York City Midtown Alley and introduced you to what Chinese cuisine should be like. Truly spectacular. Highly Recommend. Do I think Indian food is some of the best in the world? Yes. Yes, I do. Let's jump into this! It's barely Indian food... but it gets five stars in my book. 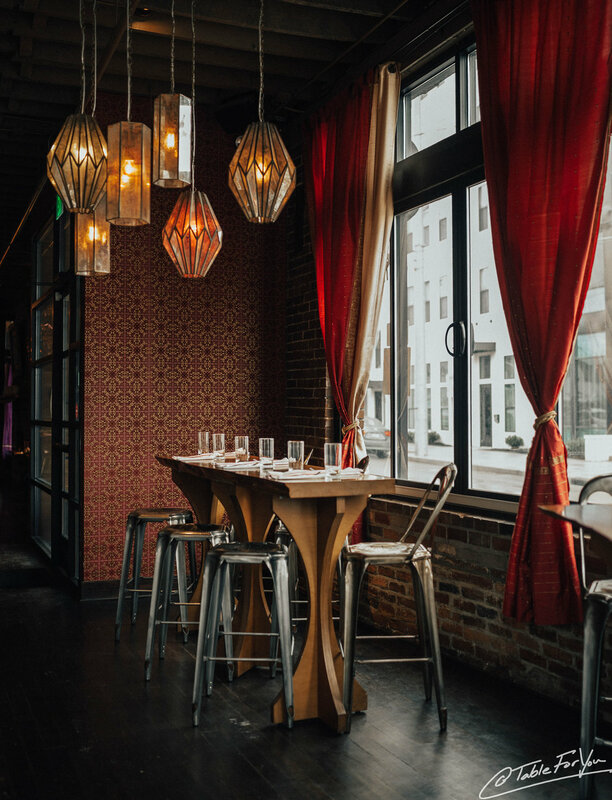 No way around it, this place is not your traditional Indian cuisine. Why? Because beef. Let me explain. Go to any authentic Indian restaurant in the entire world and you will not find one ounce of beef. No beef stock. No meat. No bone. Not even the word will be found. That's because Hindu Indians believe the cow to be a symbol of prosperity and reverence (not to be confused with the misconception that they are worshiped). So what was my reaction to seeing beef on the menu? Pretty shocked. I asked the server what the idea was behind it. He answered saying that this is a restaurant that is influenced heavily with Indian Cuisine, yet it incorporates that culture with others. I kept looking at the menu and although I saw a Mango Lassi, I also saw 'nachos', 'poutine', 'corn dogs' and 'tacos'. What the??? I am now a believer. Sure, you can be a purist and believe that tacos are better if they stay mexican (guilty), or you can step out of your ideas and embrace something new. Chauhan nails it. I mean it. They NAILED it. Even down to the decor I knew this was going to be something different. It just makes you feel like you need to be there. This shouldn't be a surprise to those foodies out there. Chauhan is owned by Morph Restaurant Group. This is the same group that was started by Chef Maneet Chauhan. The very same that competed in Chopped and Iron Chef. But that's just the TV stuff (we all know how I feel about that). She graduated from the top culinary school in India and then attended the nations prestigious Culinary Institute of America in New York. She has even won a James Beard award for Excellence. I have had the pleasure of working with a woman who received a James Beard Award and let me tell you, those that receive these awards are inspirational. What I love most is that she is spot on, on what a restaurant group should look like. I LOVE IT. Blended beef. Green Chile Bacon. Amal Cheese. Chaat Masala Onion Rings. Red Wine Demi. Black Sesame Bun. It really is a masterpiece. Not one bit was dry or missing flavor. The consistency of the bacon was enough to please the crunchy or the soft bacon eaters. It was all just made so well. (The salad featured is the Spiced Farro , not jaw-dropping, but still way good - other option is Masala fries). It did not taste immediately Indian though. You focus on the meat and onion rings and you will miss it. Instead, focus on the slight kick of the chili, and then that slight acidity you feel from the Chaat Masala vinegar. It's there. That's what makes it such a perfect marriage. If you couldn't tell by now, this place gets a Dan Rivera Award. Not as prestigious as the James Beard, but still dang good. Let's get this out of the way. I love Ramen. It's a thing. I'm not talking about that packaged stuff you donated to school for some food drive. That stuff will kill ya. I'm talking about that authentic stuff. Just as salty but way better. If you like Maruchan, then you can just stop reading. Ain't got room for that palate here!! That's enough. Let's jump into this. Two Ten Jack. Branding. There is a reason why companies make loads of money off helping other companies find their brand. Think about it, you see a swoosh and you immediately think, Nike. You think smartphone and you go, "iPhone". You think trash and you think of Maruchan and Top Ramen. That's what branding does. Two Ten Jack has got it down. From the location to the menus, this place has thought it through. I mean, where else do you go, order a bowl of ramen and can watch completely random anime on the wall?? Like I said on the insta, this is pretty much just a Ramen review. I'll be back to try out the other items. Hoping they are just as good. Cause the Ramen is spectacular. Now if you're a new comer to the Ramen world, welcome. Also, know that Ramen is naturally salty. You can't make a couple day long broth without it being salty. I mean, you can, but you shouldn't. I ordered the Tonkotsu. Pork broth, bamboo shoots, kombu (kelp), pork back, I added some mushrooms and all that is on top of a solid bed of ramen noodles (more things in it I did not mention). You ready? Cause it looks as good as it sounds. BOOM! Yeah, I'm also impressed with the low light photography. Besides that, it really was some good ramen. There is a practice called kaedema. It essentially means that you want a second order of noodles to finish with the leftover broth (you know it's common when a word for it exists). No need for kaedema here! Now the noodles are the only part that I had grief with. They aren't terrible but they aren't the best either. They feel like just noodles. Which is funny because it is made by Sun Noodles in New Jersey. Pick up the slack New Jersey! (Sun Noodle actually customizes their noodles based on the specification of the restaurant that ordered it). I really did enjoy this experience. I do have to address one thing that may seem different to some of you. Two Ten Jack does NOT do take-out or leftovers. Yeah, you heard me right. You better eat all your food or you aren't leaving the table (Grandma Two Ten Jack, am I right?). Why does this exist? Because they don't have containers. That was the answer. It could also be the fact that any bone broth is going to congeal. They want to save you the trouble. Either way, well done Two Ten Jack (which, by the way is a Japanese Card Game). I crave pizza about 70% of my waking days. That and Asian food. Yeah they aren't related at all but it's what the body wants! (not what it needs). So when the gracious locals said to check out Five Points Pizza, I couldn't say no. As soon as I walked up I knew this was going to be something good. I look for organization and something different when I check out new places. The sign was well lit, and the restaurant was divided between carry-out and sit down. That took some foresight. Now if you ordered a pizza, you wouldn't have to be crammed in the dining space awkwardly looking at the guy eating right next to you (more on that later). Now on to the food. I tend never to let myself get to extreme hunger mode but today was an unusual day. Sat down, asked for water (with no ice), and immediately ordered the Garlic Knots. Why? Because you can immediately tell how a restaurant will be from their Garlic Knots. This is fact. They weren't delicious. They weren't gross. They were just good. 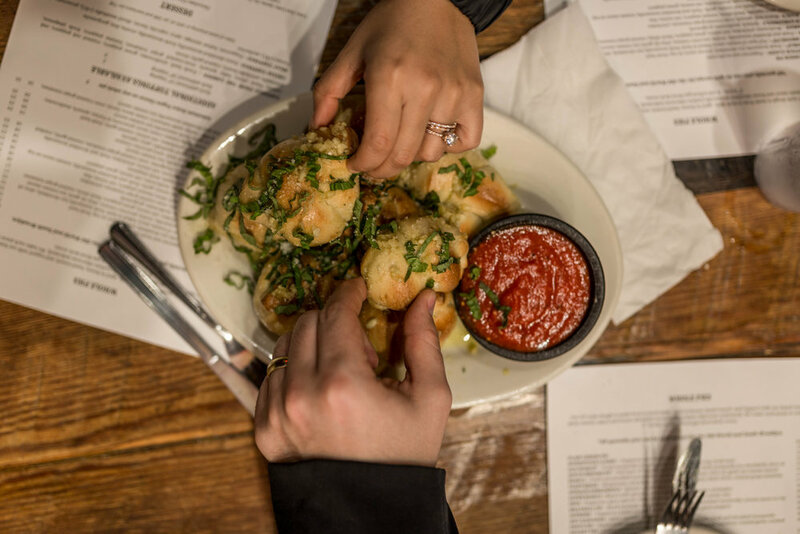 The bread lacked that soft, melt in your mouth sort of texture that the garlic knot should possess. The bread was just too oily. The plate was covered in it. All that caused the marinara to just roll off the Knot. Unless applied with a spoon or fork, you definitely weren't dipping it. I wish the bread itself contained more butter within it. Instead of pouring the fat on top, incorporating it may have been a wiser choice. Either way, we quickly let those be and waited anxiously for our pizza. So some rules here: you can split pretty much any pizza except for the Brooklyn and the Old World. That means you can take your picky-eater friend out here. Besides that, you have free reign. We opted to go with the Vodka Sauce pizza and the T-Rex. Just look at it. Immediately you are like "yeah. that's gonna be good", and if you said that, you would have been correct. It was delicious. Best pizza award? nah, but for feeding all 3 of us while still being delicious it deserves some praise. the Vodka Sauce pizza had a unique flavor to it. It carried prosciutto, basil and mushrooms that all married so well. The T-Rex, as you can frankly guess, was packed with meats. The sausage carried that distinct pizza sausage flavor, but wasn't the only thing you could taste. My one and only complaint, and this may be a deal breaker for many of you, is that the crust was almost there. I think that's what really held me back. Now this is just the first time. I am looking forward to going back (I heard the Stromboli is magnificent). Do I recommend this place? For sure. I would definitely say that my visit there was worth it. Great toppings, amazing variety (something for everyone! ), perfect price point and awesome vibes make it a worthwhile dinner spot to kick back. Pizza lovers rejoice!